I used to LOVE those absolutely horrible, unhealthy, undeniably tasty deep-fried potato skin appetizers at restaurants. That combination of potato, salty bacon, and cheese is irresistible to me. Of course, I try not to eat things like that very often anymore, and certainly I don’t encourage L. and P. to eat those things. But the fact remains that a good stuffed potato skin sometimes just seems like the right answer. These are a somewhat healthier version — more potato left in the skins, no deep frying, the addition of broccoli, and actual cheese rather than the plasticene processed cheese product that’s typically used in the restaurant version. L. ate every last scrap when I put these into his Thermos. They’d actually make a pretty good simple dinner, too — if you had the filling ready in the fridge and the potatoes already cooked, you could reheat everything, assemble, and have a fun meal on the table in no time. Cut the potatoes in half lengthwise. 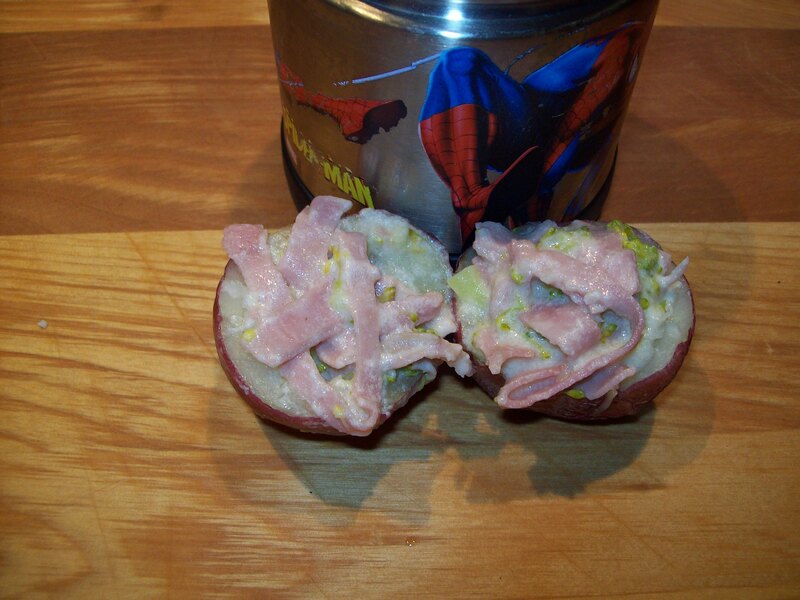 Scoop out the centers, leaving a shell generously lined with potato meat. In a medium saucepan, melt the butter. Whisk in the flour and cook for about 1-2 minutes. Slowly add the milk, whisking, to make a smooth liquid. Bring to a boil, reduce the heat, and simmer for about 5 minutes, until the sauce begins to thicken. Add the cheese and broccoli and cook, stirring occasionally, for another 4-5 minutes, until the broccoli is cooked and the cheese is fully melted. Taste and season as necessary. Stir the ham/bacon/turkey into the cheese mixture. Scoop the filling into the potato shells. 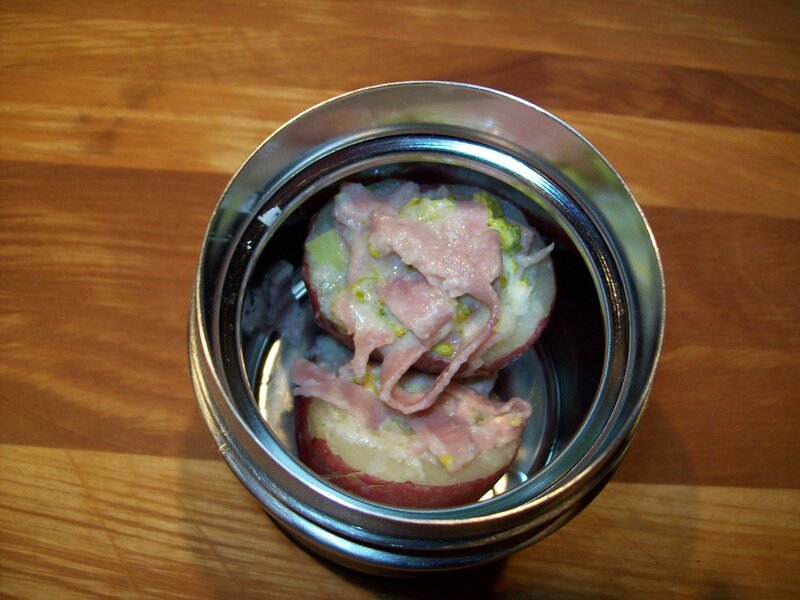 To pack in a lunchbox, I place two of the potato boats gently into a preheated Thermos and cover immediately.